I’ve been doing a lot of walking. It’s good for my body and my head. Mostly I shimmy along to tunes delivered directly to my ears courtesy of some splendid headphones. I have a walking playlist on my phone – of tunes for tackling hills, striding purposefully or whimsical rambles. This morning I walked to a different soundtrack. Mindfulness. It’s a bit of a buzzword. Something of a trend. I am undertaking an introductory course explaining the theory and practice of mindful behaviour. I’ve discovered some interesting aspects of myself, one of which is that I already tend towards the mindful. My walks are often meditative, despite the headphones. I observe the gardens, the birds, animals, plants, the play of light. Sometimes I am literally lead by the nose and follow the scents of jasmine, rose, dianthus, lavender. Today I decided to walk without headphones. I had chosen a shared footpath along the Yarra. The decision to allow my ears full reign was principally for safety – being mown down by a Lycra-bedecked cyclist not being high among my list of priorities. Not long into the walk, and already feeling attuned to the soundscape and noting the preponderance of human noise, I came across one of the signs for the Heidelberg Artists Trail. 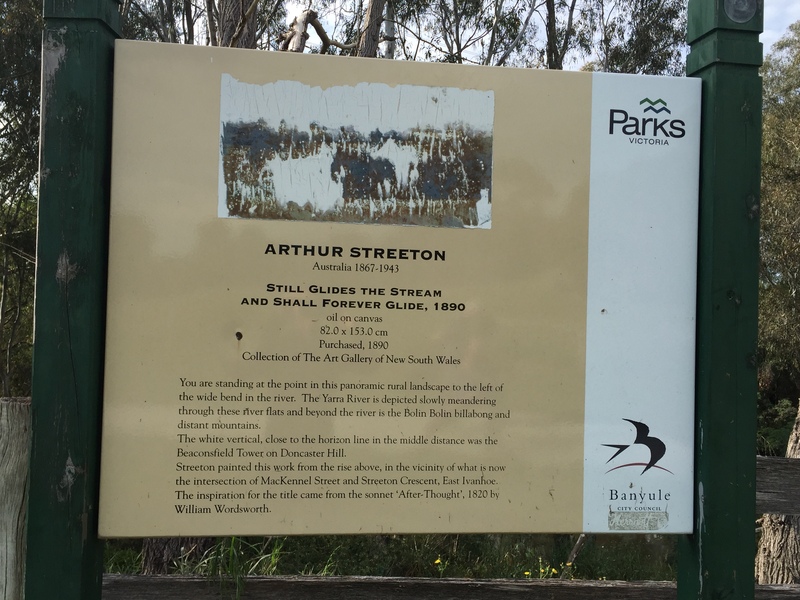 Arthur Streeton’s “Still glides the stream, and shall forever glide” had been painted from nearby and the title made me aware of the manifest silence of the river. This continual flow, silent into the future, that seemed to draw the sounds into it, as though creating a hushed void. And so my walk became ekphrastic – a future-bound flow, surrounded by sound.